eHealth NSW’s Electronic Record for Intensive Care (eRIC) went live at The Tweed Hospital (TTH) and Lismore Base Hospital (LBH) on 13 November, marking yet another way in which digital tools are enhancing patient safety across the state. Hot on their heels will be Grafton Hospital, where eRIC is scheduled to deploy in early December, completing the roll-out of eRIC across all Northern NSW Local Health District (NNSW LHD) Intensive Care Units (ICUs). This is the first time a state-wide electronic ICU system has been deployed anywhere in Australia and it will be one of the largest in the world. 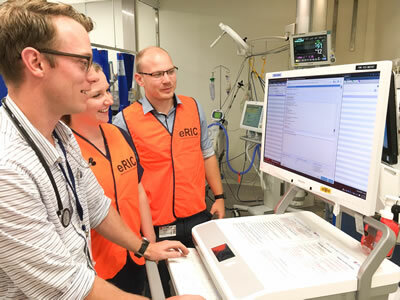 Instead of using paper charts and forms to care for their critically ill patients, all three of NNSW LHD’s hospitals’ ICUs are now using eRIC, an ICU Clinical Information System (CIS). Stevie Griffith, Nurse (Critical Care and Emergency) at TTH, said the ICU clinicians appreciate having patient data in a central electronic location. Dr Mike Lindley-Jones, ICU Director at TTH, said patient safety is driving the transition to an electronic as opposed to paper-based system. “A new system is a big change for our ICU,” Dr Lindley-Jones said. “We were apprehensive at first, however, knowing eRIC increases information availability and reliability assured us we are further supporting clinicians to manage patients safely." NNSW LHD will soon join Mid North Coast LHD as having eRIC across all of its sites, improving communication and visibility of patient information between the hospitals. LBH and Grafton work closely together, with LBH the primary referral unit for Grafton Hospital. The sites have mirrored practices to ensure their patients receive a seamless transition. Kelli Coleman, Acting Nurse Unit Manager at Lismore, is confident eRIC will foster greater collaboration between the hospitals. "Being able to view a patient notes at any time outside of the ICU will assist ICU clinicians, especially when patients are transferred to Lismore," said Ms Coleman. "Clinicians can now check a patient’s vital signs prior to admitting them to our ICU, allowing the sites to work more collaboratively and improve visibility of the patient." "eRIC has put nurses back at the bedside by automatically syncing patient observations into the system. Before eRIC, nurses would spend lots of time with their backs turned on a patient in order to document observations." The transition from paper-based will improve patient safety within ICUs by enhancing clinical communication within the hospital. Jason Muller, Local Application Specialist, for Northern NSW LHD shares the enhancements eRIC will bring to ICU clinicians. “The change from charting patient records electronically improves the accessibility of patient information by having data in one location,” said Mr Muller. “This also improves safety through features such as medication alerts. eRIC provides reliable information, that is simplified." The state-wide roll-out of eRIC continues apace, with deployments at Blacktown, Prince of Wales and Grafton Hospitals before Christmas and further go-lives planned for 2018.